Life has a way of finding excuses. I decide if those excuses will be the driver or just something on the side of the road that I pass by. The day started with a crash – literally. I went out on the porch to see what had fallen over only to be left without an answer. I wondered if it might be one of the stacks of boxes I had stored in the bedroom of my oldest son. The sun still hid behind the mountain, so I decided not to wake him to find out what might have occurred. I settled into my study time – since I was already awake. I had just finished my Scripture reading when the home phone rang. I jumped at the noise because I did not want the boys to be disturbed (since the sun was still not up) and I always panicked at who might be calling at such an early hour. Now he had me curious. I put on my shoes and walked across the field to his house. Two limbs (and by limbs I mean small trees) had crashed down next to his trailer. It was not close enough to total the trailer, but it had hit it and called a horrible crash – the same crash that woke me. The day continued to be full of trials, tribulations and distractions. My commitment for change was challenged on multiple levels. By the time I settled back into the my house, I wanted what I wanted. “There will always be excuses.” I have been challenging myself to do something to benefit my Spirit, my mind and my body. The book I was reading almost shouted the words out at me. I continued to read and soon felt my resolve strengthening – despite all that I had faced and all that would lie ahead because of it. I can stop now, but I will never change if I stop now. I can give in, but I will never move on if I choose to give in. I can quit, but I will never reach my destination if I quit moving. I know that things will happen and life will try to get in the way – that is why any plan for change has to have some flexibility built in. Not enough to get me off track in my journey, but enough to get me around the twists and turns. 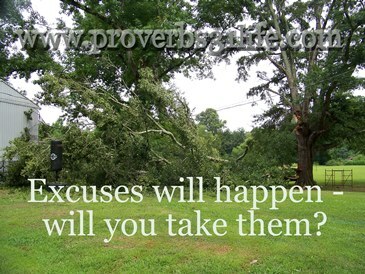 I have to have a plan around the excuses if I want to keep those excuses from getting in the way. Are you hungry for change? You can have anything you want if you are willing to take the necessary steps in your life to achieve what you desire. There will be excuses not to do it – but the moment the desire overwhelms the excuses you will be on your way to success.